I’ve been hoping for several months that I would be paired with Bellini Valli of More Than Burnt Toast for Taste & Create, and it finally happened! I was delighted, and looked forward to spending some time browsing her site. Unfortunately work and other stuff got in the way; and by last week I had a list of “only” a dozen or so recipes I wanted to try, and no time to try them. Finally yesterday I had some free time,so I looked for something quick to do (in passing, I discovered that oddly enough Val — or at least her friend Lillian — was the originator of the crater banana bread I cooked for the last round of T&C). I hovered over the apple pancake, the apricot and ginger scones, the lamb sliders and half a dozen others … but finally, the pear upside-down cake looked irresistible for a chilly autumn day. I used some of our local herb-flavoured garrigue honey, and Louise Bonne pears. Fresh thyme is hard to come by at this time of year, even here, so I sprinkled on some dried. Apart from that and my usual conversions, I followed the recipe exactly. It got the thumbs up from both of us, served still warm with a dollop of crème fraîche. OK, maybe it doesn’t quite reach the gingery, caramelised heights of my Best Dessert Ever, Springfield Pear Cake — the combination of pears and ginger can’t be beat in my opinion — but it is pretty darned close. The caramelised honey gave it a delicious spicy flavour, and the sponge was feather-light. I will definitely be making this again … and again … and again. Thanks Val for an enjoyable browse and a delicious dessert — I’ve tucked several other recipes away for later! Preheat oven to 175C. In a 9-inch ovenproof frying pan (the original recipe specified it should not be non-stick, I’m not sure why) simmer honey for 7 or 8 minutes until it begins to reduce and caramelize. Watch carefully and do not let it burn; if it starts to smell burnt, remove from heat. Arrange pears, close together and cut-side down, in a circular pattern in the pan, stem ends pointing toward the centre. Pack them in tightly; they will shrink as they cook. Cook over medium heat, turning them from one cut side to the other, until they begin to turn golden, about 10 minutes. I used tongs to manipulate the pears throughout. Flip pears over to their curved side and scatter with thyme if using. Transfer pan to oven and roast, uncovered, until very tender, about 25 minutes. Meanwhile, in a large bowl or food processor, whisk together sugar and lemon zest. Whisk in eggs and vanilla. Fold in flour and salt; stir in all except about a tablespoon of the melted butter. When pears are soft, remove pan from oven, discard thyme sprigs and brush edges of pears and pan with remaining melted butter. Pour batter evenly over pears and scatter flaked almonds over batter. Bake until a skewer inserted in the centre comes out clean, about 30 minutes. Don’t be afraid of overcooking it; the more caramelised it gets the better, so if in doubt give it a few more minutes. The original recipe said to cool the cake for 30 minutes before turning out; I did it straight away by gently loosening the edges with a palette knife, placing a plate on top, gripping firmly, and flipping it over. If any bits of pear stick to the pan, you can detach them with a palette knife and replace them. Like Springfield pear cake, this is best served warm rather than hot, with a blob of crème fraîche. But having just eaten the leftovers, I can vouch for the fact that it’s excellent cold too! Beatifuls, simply beautifuls. I just love pears! This is my absolutely *favourite* cake, served after a meal with thick cream or creme fraiche, as you show, or thin cream poured over. It’d be the thymey honeyed one I’d be going for (never having had the ginger one I admit) – scented sweetness – true british hautley cuisine, sublime and simple. The Guardian are publishing a pic of Heston Blumenthal’s kitchen today (http://www.guardian.co.uk/books/series/writersrooms): it might amuse . . . 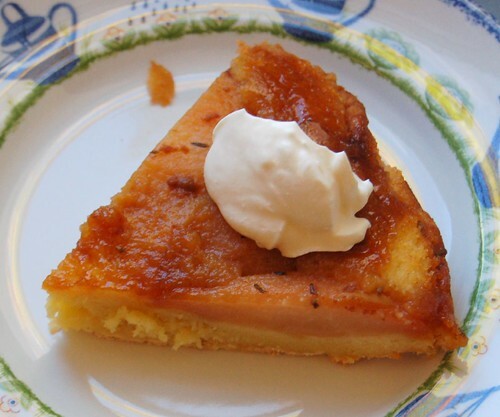 I do make pineapple tarte tatin sometimes — it’s very nice! Taste and Create sounds fun, but I can’t even keep up a bit with Foodbuzz, so I passed on it. I also don’t really post recipes to my blog, so it might be difficult for my partner!